Samsung has just dropped an announcement recently that both of its 8.4- and 10.5-inch models of the Galaxy Tab S are now available, where both models will sport the ultimate viewing experience alongside the world’s first high-resolution Super AMOLED display. 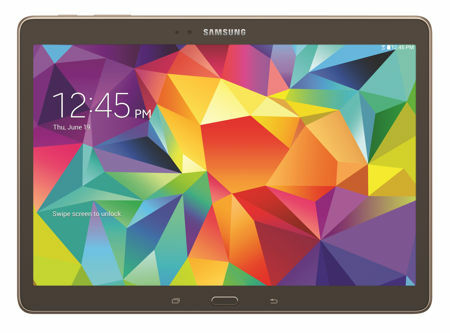 The Samsung Galaxy Tab S will merge Samsung’s thinnest and lightest tablet design alongside what they deem to be the most advanced WQXGA Super AMOLED display ever to arrive from the South Korean consumer electronics giant. If you have decided to pick up the Wi-Fi version of the Galaxy Tab S 8.4, it will be made available for $399.99 a pop, while those who would prefer the Galaxy Tab S 10.5 will have to fork out another Benjamin more at $499.99. Pre-orders for the Galaxy Tab S (Wi-Fi version) already kicked off last week, where they can be purchased over the counter next month at a variety of channels. If you have enough patience and are looking for more connectivity options, then you can always check out the Galaxy Tab S that has LTE connectivity, which will be made available some time later this year, as it arrives on AT&T with LTE, Sprint (Galaxy Tab S 10.5) with Sprint Spark, T-Mobile (Galaxy Tab S 10.5) with LTE and Verizon Wireless (Galaxy Tab S 8.4 and Galaxy Tab S 10.5) with LTE. The Galaxy Tab S has been specially designed to feature screen quality and style merging together, with users enjoying an extremely immersive viewing experience. It also happens to be one of the few Android-powered devices in the U.S. that will deliver Netflix HD content viewing. Apart from that, it happens to be the lightest, thinnest tablet that is a whole lot easier to bring it around with you, measuring a mere 6.6mm thin while tipping the scales at under a pound. There is also a slew of customizable settings and privacy features that allows you to share with family members of all ages, as a Kids Mode ensures that your little ones will not mess around with your work files, while there is a built-in fingerprint sensor that makes it a snap for multi-user access easy and delivers added security. Any takers?